Ted Chronopoulos, who played in MLS from its inception in 1996 to 2002, went straight into youth coaching after his playing career. 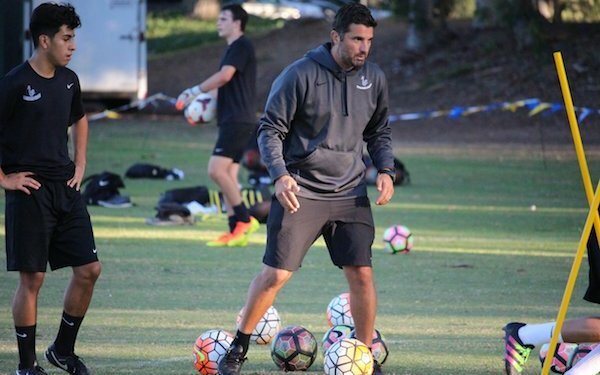 He is the Boys Academy Director of Pateadores, one of the largest clubs in the soccer hotbed of Southern California, whose alum include Frankie Amaya, the No. 1 pick in the 2019 MLS SuperDraft. How did you get your start in coaching? TED CHRONOPOULOS: When I was with the MetroStars, me, Tab Ramos and Marcelo Balboa took our B license course together while we were still playing. It was really eye-opening for all of us. CHRONOPOULOS: The terminology of being a coach, how different it was from what you thought about as a player. Now fast forward 10, 12 years -- players think differently now. Players think more like coaches on the field. What was the adjustment like, from being in the professional environment to coaching youth? CHRONOPOULOS: There’s definitely an adjustment, going from the mentality of a player to a coach. You have to be more detail-oriented in terms of your terminology and providing information when coaching, because young players take things very literal. They really take what you say to heart, so you have to be precise in your message and what message you want to get across to them. But you also have to have more patience, and appreciate the exploratory phase, where they have to problem solve on their own. You can’t always give them the answers. What was your introduction to soccer? CHRONOPOULOS: I grew up in Rialto in Southern California. My father was an immigrant from Greece. It just started from home. I grew up playing around the house with my dad, and on the street. I did the whole AYSO thing, starting when I was 10 or 11. I got into club soccer at about 14, joining a new club in San Bernardino, Corinthians. Carlos Juarez was my first club coach. Ralph Perez also coached at the club. You could say I was a late developer. I was never called into any youth national team camps. Wasn't involved in ODP. Chronopoulos played college ball at Cal State San Bernardino, where Juarez was coach, in the early 1990s, before playing a year at San Diego State. He then went to Greece, where he joined Panionios FC. CHRONOPOULOS: The off-field transition wasn’t as difficult because I spoke the language, so it wasn't like I had to adapt to a different culture. I had gone to Greece every summer as a kid. I had that advantage. But I had to cope with all the ups and downs of becoming a professional player, like not making the roster on game day. I came away a better player because of the challenges. He returned to the USA in 1995 for MLS’s 1996 launch. CHRONOPOULOS: I thought maybe I’d be allocated to a team, but I had go to a tryout with hundreds of players [MLS’s 1996 combine]. I had to start from scratch and impress New England enough to get picked in the first draft. The New England Revolution selected Chronopoulos in the fifth round, 45th overall, in the 1996 draft. He played six seasons with the Revs, joined the MetroStars in 2002, and returned to the Revs for the end of that season. A two-time MLS All-Star (1997, 2000), he finished his playing career in 2005 after stints with the A-League's Charleston Battery and the Chicago Storm of Major Indoor Soccer League. Influential coaches from his pro career. CHRONOPOULOS: My coach I had in Greece. I went on trial as a central midfielder and he said, You're never going to make it as a central midfielder. Would you consider playing as an outside back? You have a lot of good qualities and we're looking for an outside back. I said, Why not? That’s how I ended up playing 13 years as an outside back. Thomas Rongen was a very good coach. I learned a lot about the tactical side from him. He opens your mind. He pushes you hard. Thomas treats everyone fair, but he's going to get on you when you need it. Fernando Clavijo, who just passed away, was a good mentor. Not only as a coach, but he was a good person. A good family guy. He taught you good values. Walter Zenga [who served as goalkeeper and coach of New England], although he had some trouble in MLS, was tactically very, very sharp, coming from Italy. Especially for me, because I was a left back, I got to spend more time with him than maybe an attacker would. He opened my eyes on the defensive side. ... I'm probably missing quite a few, but they were certainly influential. U.S. U-20 star Frankie Amaya playing for Pateadores. “He had the ability before he came,” says Chronopoulos. “We just gave him a bigger platform to showcase his skills, provided all the resources as a club, and he's taken advantage of it." Chronopoulos has coached in the U.S. Soccer Development Academy since its launch in 2007, starting with LAFC (no relation to today’s LAFC), then Chivas USA, and the short-lived Cosmos West. CHRONOPOULOS: Cosmos West kind of exploded and then deteriorated, but I got to work with Eric Cantona – it was great to pick the brain of someone who was one of the best players in the world at one time – and Giovanni Savarese. Gio and I are still good friends. We played together in New England and we see soccer the same way. So that was a good match. On the Development Academy's progress. CHRONOPOULOS: It’s made tremendous strides from an organizational standpoint, from a competitive standpoint, from an accountability standpoint. As a coach, you cannot just go out there and roll out a ball. It makes you think about the game precisely. On how difficult it is for an amateur youth club to compete in the DA against MLS clubs. CHRONOPOULOS: It has its challenges because we don't have the backing of MLS ownership, but Pateadores has the backing of some great board members and leadership from Jon Szczuka [CEO]. We're fully funded from 15 and higher, boys and girls in the Academy. Our younger players have a small fee. Our 12s through 14 have a small fee. Every year were hoping to knock down an age group so eventually in four or five years we'll be fully funded for our academy. How is Pateadores able to provide cost-free soccer for its Academy players? CHRONOPOULOS: Fund-raising. A lot of fund-raising. Sponsorships. One of the concerns in American soccer has been that it hasn’t taken full advantage of its Latino talent. Frankie Amaya is an intriguing case, because he was discovered by Pateadores playing in Santa Ana Mexican-American leagues. CHRONOPOULOS: I think Pateadores have paid attention to kids like Frankie since day one. I was a kid who played against Pateadores, and they always played a good brand of soccer. When I recently came in, we had a lot of players similar to Frankie. I do think we give young Latinos an opportunity, especially at Pateadores. I think we have a good combination of players. I’ve seen it first hand with Frankie. If you give a kid who comes from that background, that culture, a chance, if you believe in him and he believes in you, and what you're trying to do for him, I think you're going to get more out of him. By my estimation, Latino coaches are under-represented nationally among coaches with the high-level U.S. Soccer licenses. What’s your impression in California? CHRONOPOULOS: I see a lot of Hispanic coaches in Southern California. I see a lot in Northern California. In Southern California, LAFC, ourselves, the Galaxy – all have a good influx of the Hispanic culture. I see a lot of Latino coaches at the youth levels. Now at the youth national team level, we’ll hopefully see more in the future. But at the youth club level, we have a lot of young, aspiring, good Hispanic coaches in our community. On coaching players at the youngest ages. CHRONOPOULOS: I think our best coaches should be with the younger ages but unfortunately youth soccer has become more of a business and at a lot of clubs the business opportunities are at the older ages. We need to get better coaches at the younger ages. It's your attention to detail. The verbal communication that you have with kids these days is so important -- the feedback you want give them on a daily basis on what they need to improve. A lot of kids are very hungry and driven to be better. I think as coaches we need to give them more detailed information on how to succeed and become a better player. How does Pateadores encourage players to work on their game outside of club activities? CHRONOPOULOS: We have homework assignments. We give them skill challenges. We have a video portal that they do homework on. They watch themselves and they have comment on themselves -- three objectives that they find that they can do better at, as an individual. And then also three objectives of what their team can do better. We do have to be very cautious of how much we give them because of schoolwork. We want them to have a home life, life outside of soccer, and explore other activities. There's a balance between soccer and life outside of soccer. In wake of the USA not having qualified for the 2018 World Cup, where do you find reasons for optimism? CHRONOPOULOS: You can see young players playing for MLS clubs and going overseas and attracting attention there. So, I think there's a lot of young talent. I think Gregg Berhalter was a very good hire. He has a good sense of the millennial player vs. the older player and trying to find that balance. You're not going to be able to field 11 under-22 kids, but try to find that balance between leadership and younger talent, and I think we're on the right track. We have to remember, we're still in our infancy stages in terms of a soccer country. I think we've done a very good job of identifying the young talent that's out there but it's still a work in progress. 13 comments about "Pateadores' Ted Chronopoulos on the Development Academy, Latino talent, and soccer 'homework' for kids". Eric Jensen, March 20, 2019 at 10:51 a.m.
good interview. thanks for this. Bob Ashpole, March 20, 2019 at 12:11 p.m.
Wow. Chronopoulos is a breath of fresh air. Thanks, Mike. frank schoon, March 20, 2019 at 5:29 p.m. I"m still waiting for an interview with Tata. I don't get it, here is a coach who did a wonderful job with Atlanta United and put it on the map of US soccer....and SA has totally ignored him. beautiful game replied, March 20, 2019 at 6:05 p.m.
Frank S., one coach interview at a time...more should follow...I also would like to see an interview of Milan AC icon Maldini who is in the youth development system. Bob Ashpole replied, March 20, 2019 at 7:51 p.m.
Frank, I didn't see Tata giving anyone interviews. All the articles I saw about him were from second hand sources. frank schoon replied, March 20, 2019 at 9:18 p.m.
BG, that is fine about Maldini, but Tata has been around here for over 2 years, and considering what he has accomplished and he is still fresh in the fans minds, he’s still hasn’t been interviewed. And Klinsman since he’s been fired from USNT has never been interviewed concerning what he thinks about the US team and other things....and how long has that been. This interview actually offers nothing insightful, i’ve read more interesting ones from Mike Woitalla. frank schoon replied, March 20, 2019 at 9:37 p.m.
Bob Ashpole replied, March 20, 2019 at 10:19 p.m. Thanks for the links, Frank. Not much substance to them. frank schoon replied, March 21, 2019 at 8:20 a.m.
Ric Fonseca, March 23, 2019 at 2:32 p.m.
... and I thought the comments, at least 95% of themn would be about Coach Ted C! Tata? Well it's a "ta-ta, folks, I came I coached and got paid ok, so it is now hasta la vista baby!" To coach Ted, thank you for your insight re: the Latino "situation" Say hello to Coach Carlos Juarez, known as "El Motor" when he was in high school! Ric Fonseca, March 23, 2019 at 2:49 p.m. I forgot to add that here in So California just about everyone in "youth club soccer" (please NOT to be confused with the mega-youth rec leagues) is very familiar with the Club Pateadores (Spanish for kickers) or "The Pats," that together with other very strong and highly qualified "competitive youth clubs" form the backbone of our vast and growing all inclusive (or at least "all") youth soccer movement. In addition to Coach Ted C, and Coach Carlos Juarez, the So Calif youth soccer scene at one time or another included - and still does - Coaches Martin Vazquez, Ralph Perez, Cherif Zein, and the So Cal Blues Club, North Hollywood Jets, Manhattan Beach Hurricanes, etc, that have also helped shape and form a very competitive youth club soccer scene. Oh, there is so much to tell and talk about!!! Bob Ashpole replied, March 23, 2019 at 3:47 p.m. I cannot imagine organized soccer in the US without any Hispanic participants, because I have never experienced it. To the extent that it exists today, suburban organized soccer without Hispanic participants is atypical. That brings me to your point Ric. So given the heavy involvement of US Hispanics elsewhere in US soccer, why aren't more US Hispanics included among the USSF staff and managers? Ric Fonseca, March 25, 2019 at 3:36 p.m.
Bob A: An excellent question for which we've been asking for over four decades, and although we had a Modicum" of success in getting some US HIspanics in USSF staffing and managers, suffice it to say that it is - and some will cringe with the following - due to the probervial and ever old "good old boy network." Our modirum of success came during the WCUSA 1994 and our newly formed - although short lived - LASCA (Latin American Soccer Coaches Association of America) yet when Hank S and Alal R left, it was back to business as usual. I will also add here that the old NSCAA - now United Soccer Coaches - the association's BoD, did awoke, but in the process, it didn't last due to various and sundry reasons. Lastly, IMHO, when I was with the old CYSA-S, the reluctance factor to have the youth affiliated association was extremely reluctant to even have its rules, by-laws, etc., translated into Spanish, and it took a long time for the other local youth recreation league to even venture east into the barrios Latinos. As I said above, "oh there is so much to tell and talk about...(sic"